Early versus interval cholecystectomy for acute cholecystitis: 5 years local experience. Wagih Mommtaz Ghnnam, Mohammed Eid Alzahrany, Turki Maed Al Salem Elbeshry, Ahmad Ali Alqarni, Saad Mohammed Al-Shahrani. Background. Early laparoscopic cholecystectomy for acute cholecystitis is technically demanding procedure associated with more rate of conversion to open cholecystectomy and more complications. Recently some studies demonstrate the feasibility of laparoscopic cholecystectomy for acute cholecystitis. However, many surgeons still prefer delayed laparoscopic cholecystectomy for acute cholecystitis. Patients and Methods. Between January 2010and January 2015, 62patients with a diagnosis of acute cholecystitis underwent early laparoscopic cholecystectomy within 72âh of admission (group I). This study group was compared with a control group of 114patients of acute cholecystitis, who underwent delayed laparoscopic cholecystectomy after an initial period of conservative treatment (group II). Results. There was no significant difference in the conversion rates (3 in group I versus 2 in group II), duration of postoperative stay (2days in group I versus 3.5 days in group II) postoperative analgesia requirements and postoperative pain scores. 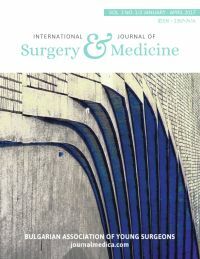 However, duration of surgery was significantly more in group I (110 minutes versus 85 minutes in group II).No mortality was seen in either group. Total costs were higher (6450 ± 875.4 versus 8570 ± 775 Saudi Ryal; P = 0.0001) in group II patients. Conclusions. Early laparoscopic cholecystectomy for acute cholecystitis is safe, feasible, with shorter hospital stay and cost effective management of acute cholecystitis cases.